How excited are you to have everyone coming to your home this year. Start making the lists. Bring out your china or best dinnerware. 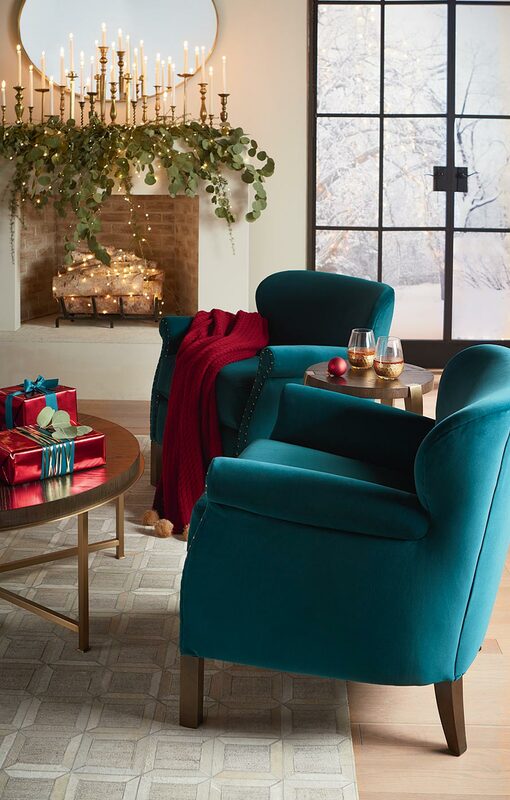 And imagine how you’re going to magically create extra seating for the holidays … in the great room. There will be your immediate family of five, plus your two siblings and their spouses, and their four kids; on your husband’s side, you’ll have both of his parents and your bonus daughter home from college. Let’s see, that makes 16 houseguests. Wait, what? That’s sixteen loved ones gathered in one room to open Christmas presents under the tree, 16 loved ones laughing and retelling treasured old stories, 16 loved ones with buckets of popcorn watching holiday movies together … where are you all going to fit? Where are you all going to sit? The great room really isn’t as big as its name implies. With a little ingenuity, you can do this. You can make this happen. First, let’s look at ways to make more room from the space you have. Coffee tables don’t always have to be heavy, bulky and one-level. Sleek-looking Kara Ottoman styles are narrow, so they fit where most won’t, they’re two-leveled, and one especially clever version offers a removable tray. Boulder Bunching Cocktail Table at a slim 40” wide is one of the most versatile in the collection. Then again, simple tray tables might just be the answer for a crowd as big as this. To find seating for a group this large, you’ll need a clever solution. A sectional sofa design like Beckham offers a corner chair, armless chair and ottoman. Depending on the number of pieces you choose, you can configure these into four designs: “Pit”, “L”, “U”, and “Chaise” – or use a few of these pieces separately in other areas of the room. Designer Tip: Choose the storage ottoman and you’ll have a handy place to store cozy throws, tablets and magazines, and the always elusive remote. To maximize your seating options, look for a stylish wooden bench or a custom upholstered bench in one of 800 fabrics (or one of yours). Pile up more pillows and blankets on the floor, then sit back and watch how creative kids can be when they want to stretch out and relax. What’s important to keep in mind is that you and your family will all be together, under one roof, reveling in one very special time of year. If you’re like most families, this opportunity doesn’t come along all that often. Try to relax. Take a deep breath. If you want help, call in the experts -- Design Consultants are available free of charge. You can also Apply for Financing. Shop online, find a store, or shop by catalog and get your holiday home ready for all of your loved ones today.